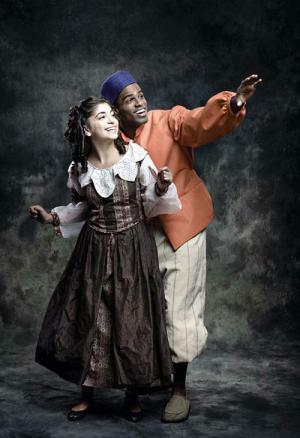 Sirena Abalian stars as Sara Crewe and Jared Dixon as Pasko in Fiddlehead Theatre Company’s production of “A Little Princess” at the Strand Theatre, Nov. 21-Dec. 8. Opening Thursday night at the Strand is a lavish musical that ends with Queen Victoria herself saving the day and declaring “anyone can be a princess.” Young ladies may find that this revival of the 2004 musical “A Little Princess” lends wings to their dreams of tiaras and coaches, but three black Dorchester males are reporting that it is giving them practical experience in re-enacting their African roots. The Nov. 21 show is the first of 14 performances of “A Little Princess” as presented by the Fiddlehead Theatre Company, declared earlier this year by Mayor Menino as the 2013-14 resident theatre company of the Strand. This “heart-felt musical for the whole family” runs through December 8. Fiddlehead is offering a special discount $10 for Dot residents this weekend only; those interested should check with the box office. Last year Fiddlehead proved it could mount a Broadway-sized production in Uphams Corner when, with assistance from the Boston chapter of the American Civil Liberties Union, it staged the hit show “Ragtime.” In addition to garnering respectable reviews, Fiddlehead’s “Ragtime” averaged 550 spectators a night over its 12-performance run, selling out a few times and breaking even over all by attracting large multiethnic audiences. Those who remember the fairly lily-white 1939 Shirley Temple screen vehicle will be surprised by the number of African Americans in this show. Burnett’s tearjerker about a British girl from colonial India who falls from being a coddled prize student to an abused servant girl in an English boarding school has morphed into an uplifting saga of a miss lovingly raised in Africa who is rescued by her native friends from the clutches of the sour-faced headmistress. Just as Fiddlehead lured “Ragtime” librettist Terrence McNally to come to see the Dorchester production, Fofonoff has persuaded both the “Princess” composer and librettist to host post-show audience talk-backs.